Summer is here. School is out. Everyone wants to have fun in the sun. School takes a backseat to summer camp, vacations and playdates. It's understandable. It's was a busy and long school year but it doesn't have to be all or nothing. You know that reading over the summer will keep your child actively engaged in learning. The question is not what benefits reading offers a child - you know it is beneficial. 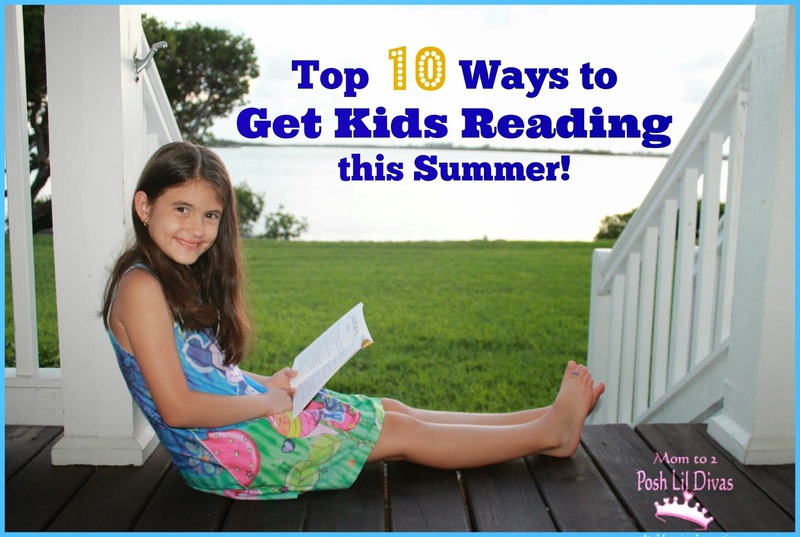 So, how do you keep your child reading when summer fun is beckoning? I'm going to share 10 tips that work for me with the Lil Divas. 1. Let them choose the book. I've learned the hard way that children are more apt to read what they are drawn to versus what we think they should be reading. I steer my girls towards material that is appropriate to their age and reading level then let them decide which book to pick up. Sometimes that means it may not be the one I would choose for them. I am ok with that - I prefer for them to be excited about reading their choice versus reluctant to read my choice in books. 2. Encourage variety. Magazines, cookbooks, comics, e-books - it's all fair game. Not only does this make reading more exciting but it also exposes young readers to a variety of media which will be beneficial to them in school. 3. Visit local bookstores and libraries. Expose children to the multitude of reading material available to them. It is plentiful, take advantage of it. Bookstores remain one of our favorite places to visit as a family. There's something there for everyone in the family. Make it a fun family outing. 4. Set a goal. Sit down with your child and ask them to set a goal for the summer. Whether they strive to read a certain number of books, aim to finish a certain series or endeavor to explore new genres - setting a goal gives them something to work towards. 5. Be a reading role-model. How can you tell your child to read if you never pick up a book yourself? I have always been an avid reader. When I was younger my parents used to have to stop me from reading because it was all I wanted to do - imagine that! My girls do not have the same voracious love of reading I had as a child but I do my best to show them that reading is fun and books are a wonderful way to stretch your imagination. 6. Schedule reading into your day. We read at bedtime throughout the school year. This isn't always an ideal time during summer so I try to set aside an additional D.E.A.R (Drop Everything and Read) time for us at least a few times a week. We all spend time reading during the day for at least 30 minutes. We may all read our own books or we might read a book together - the important thing is that we make reading a priority. 7. Get crafty. After reading a book enjoy an extension activity. Make a craft, whip up a recipe related to the story, paint a picture, make a character puppet or anything else that strikes your fancy. It will make the book memorable and it gives your child something to look forward to after reading. 8. Start a Summer Book Club. Get together and talk about the books you read during the week as a family. It's a great way to get siblings interested in books and is an easy way to check your child's comprehension. Better yet - start a summer book club with your child's friends. Everyone can meet once a week to share and chat about their books. Doing something with friends always makes it better and what's better than a book party (says the unabashed book lover)? 9. Go beyond the book. Watch the movie (if there is one), visit a place central to the story, go to the museum or do online research on the person, place or event if applicable. Bringing the book to life in a concrete way makes it exciting, memorable and it may even spark a new interest or hobby. 10. Encourage them to participate in incentive programs. There's nothing better than receiving a reward for all your hard work. There are many programs that offer free books, money and other treats for reading a certain amount of books. Check out the link for info on some of my favorite summer reading incentive programs. This post is part of the KBN's 2nd Annual School's Out Top 10 Blog Hop. and check out our Pinterest Board for lots more ideas. Have an amazing summer full of fun, lots of reading and learning! Love these ideas! So doable for busy parents in the summer. These tips are also great for any time of year, especially for reluctant readers. Thank you for participating in the Top 10 Blog Hop!! Great advice for encouraging reading! I agree with Becky - these are great ideas for all year round! Brilliant ideas! Thanks so much for sharing!